Urban Home Cover — A Parallel Architecture. Austin, Texas. The Barton Hills Residence is featured on the cover of Urban Home magazine's new October issue, available now. Completed in 2013, we worked with David Wilkes Builders to make this home a reality. Skyline views of downtown Austin aren’t typical perks that accompany the highly-desired real estate tucked in the city’s hip Zilker neighborhood. 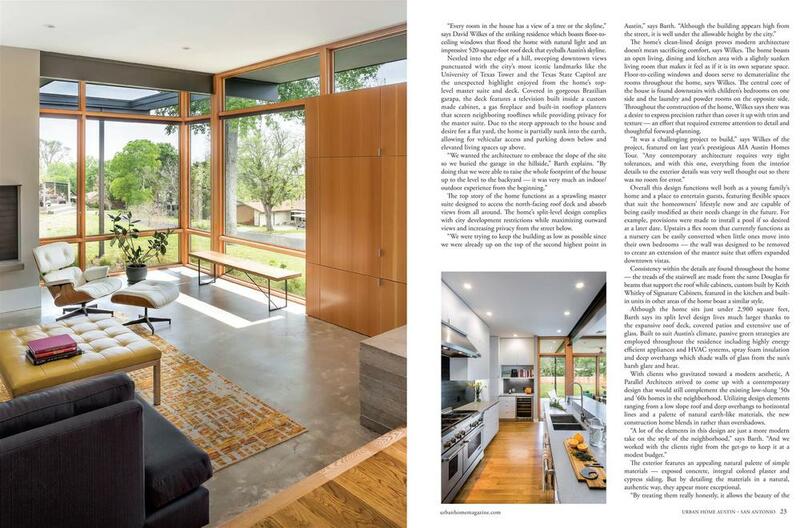 But for this modern home, sitting on one of the highest points within Austin’s city limits, downtown panoramas were part of the package –– and the driving force behind the purchase of this rare urban hilltop property. Designed by A Parallel Architecture’s Eric Barth and Ryan Burke and built by David Wilkes Builders, the objective of this nearly 2,900-square-foot, four-bedroom, three-bathroom new construction home was two-fold: to maximize its spectacular downtown views and create a flexible floor plan that would accommodate the homeowners, a young family, both now and well into the future. “Every room in the house has a view of a tree or the skyline,” says David Wilkes of the striking residence which boasts floor-to ceiling windows that flood the home with natural light and an impressive 520-square-foot roof deck that eyeballs Austin’s skyline. Nestled into the edge of a hill, sweeping downtown views punctuated with the city’s most iconic landmarks like the University of Texas Tower and the Texas State Capitol are the unexpected highlight enjoyed from the home’s top level master suite and deck. Covered in gorgeous Brazilian garapa, the deck features a television built inside a custom made cabinet, a gas fireplace and built-in rooftop planters that screen neighboring rooflines while providing privacy for the master suite. Due to the steep approach to the house and desire for a flat yard, the home is partially sunk into the earth, allowing for vehicular access and parking down below and elevated living spaces up above. The top story of the home functions as a sprawling master suite designed to access the north-facing roof deck and absorb views from all around. The home’s split-level design complies with city development restrictions while maximizing outward views and increasing privacy from the street below. The home’s clean-lined design proves modern architecture doesn’t mean sacrificing comfort, says Wilkes. The home boasts an open living, dining and kitchen area with a slightly sunken living room that makes it feel as if it is its own separate space. Floor-to-ceiling windows and doors serve to dematerialize the rooms throughout the home, says Wilkes. The central core of the house is found downstairs with children’s bedrooms on one side and the laundry and powder rooms on the opposite side. Throughout the construction of the home, Wilkes says there was a desire to express precision rather than cover it up with trim and texture –– an effort that required extreme attention to detail and thoughtful forward-planning. Overall this design functions well both as a young family’s home and a place to entertain guests, featuring flexible sp aces that suit the homeowners’ lifestyle now and are capable of being easily modified as their needs change in the future. For example, provisions were made to install a pool if so desired at a later date. Upstairs a flex room that currently functions as a nursery can be easily converted when little ones move into their own bedrooms –– the wall was designed to be removed to create an extension of the master suite that offers expanded downtown vistas. Consistency within the details are found throughout the home –– the treads of the stairwell are made from the same Douglas fir beams that support the roof while cabinets, custom built by Keith Whitley of Signature Cabinets, featured in the kitchen and built-in units in other areas of the home boast a similar style. Although the home sits just under 2,900 square feet, Barth says its split level design lives much larger thanks to the expansive roof deck, covered patios and extensive use of glass. Built to suit Austin’s climate, passive green strategies are employed throughout the residence including highly energy efficient appliances and HVAC systems, spray foam insulation and deep overhangs which shade walls of glass from the sun’s harsh glare and heat. With clients who gravitated toward a modern aesthetic, A Parallel Architects strived to come up with a contemporary design that would still complement the existing low-slung ‘50s and ‘60s homes in the neighborhood. Utilizing design elements ranging from a low slope roof and deep overhangs to horizontal lines and a palette of natural earth-like materials, the new construction home blends in rather than overshadows. The exterior features an appealing natural palette of simple materials –– exposed concrete, integral colored plaster and cypress siding. But by detailing the materials in a natural, authentic way, they appear more exceptional. “By treating them really honestly, it allows the beauty of the actual materials to speak for themselves,” says Barth. For example, rather than cover up the natural variation seen in the plaster and the concrete work, it was allowed to shine through, yielding a beautiful result. Throughout the project, Barth and Wilkes worked with the homeowners to find creative alternatives that achieved the desired look and feel without going over budget. For example, using garapa wood rather than Ipe on the deck provided a similar look and durability for roughly half the price.